HIV-1-infected persons with HLA-B27 and -B57 alleles commonly remain healthy for decades without antiretroviral therapy. Properties of CD8+ T cells restricted by these alleles considered to confer disease protection in these individuals are elusive but important to understand and potentially elicit by vaccination. To address this, we compared CD8+ T cell function induced by HIV-1 immunogens and natural infection using polychromatic flow cytometry. HIV-1-specific CD8+ T cells from all four uninfected immunized and 21 infected subjects secreted IFN-γ and TNF-α. However, CD8+ T cells induced by vaccination and primary infection, but not chronic infection, proliferated to their cognate epitopes. Notably, B27- and B57-restricted CD8+ T cells from nonprogressors exhibited greater expansion than those restricted by other alleles. Hence, CD8+ T cells restricted by certain protective alleles can resist replicative defects, which permits expansion and antiviral effector activities. Our findings suggest that the capacity to maintain CD8+ T cell proliferation, regardless of MHC-restriction, may serve as an important correlate of disease protection in the event of infection following vaccination. Human immunodeficiency virus-1 infection induces a vigorous host immune response that is critical in controlling viral replication, but this response ultimately fails in most individuals. Among those who remain disease-free for decades, known as long-term nonprogressors (LTNP),3 several MHC class I alleles, notably HLA-B27 and -B57, occur at a higher frequency in comparison to HIV-uninfected control populations (1, 2, 3), implicating an antiviral role for class I MHC-restricted CD8+ T cells that is mediated through cytolytic destruction of infected cells. Indeed, CD8+ T cell depletion studies in SIV-infected rhesus macaques (4) and the extensive literature on viral escape from CD8+ T cells (5, 6, 7, 8) support the view that this arm of the immune system exerts pressure on the virus. However, it is clear that the magnitude of the CTL response alone is not sufficient for controlling viral replication. Thus, distinct functional properties of memory CD8+ T cells are likely to be critical for abetting HIV infection, and our findings in this study demonstrate that maintaining proliferative capacity may be a key factor in conferring efficient antiviral T cell immunity, particularly among HLA-B27 and B57 nonprogressors. The ability of CD8+ T cells to proliferate is coupled to their perforin expression, which presumably enables them to kill HIV-1-infected cells (9). Of note, the proliferative capability of CD8+ T cells is impaired in individuals with HIV-1 disease progression but maintained in LTNP (9), and CTL from LTNP also show strong cytolytic activity (10, 11). Although loss of proliferative capacity in HIV-specific CD4+ T cells occurs early in infection (12, 13), only recent evidence indicates that CD8+ T cells by 1 year of infection become similarly impaired (14). At present, it is unclear whether this is a consequence of sustained high levels of viremia and/or or of the nature of the response induced by specific MHC-restricted epitopes. If the former, then vaccines that induce partial protection to HIV-1 infection by lowering setpoint viremia may also preserve CD4+ T cell memory and allow memory CD8+ T cells to maintain proliferative capacity. If the latter, then it would be important to design preventive vaccines that target responses to certain epitopes that preferentially evoke more durable immunity over time. Thus, eliciting CD8+ T cell responses before infection by immunization could potentially circumvent or delay the proliferative defect, permitting vaccinated persons, like LTNP, to be relatively spared from HIV-1 disease progression. We had the opportunity to address these issues in CD8+ T cell responses among HIV-1-uninfected vaccine recipients and HIV-1-infected patients with early, chronic and nonprogressive disease. Subjects 039-076, 039-080, and 039-022 received recombinant canarypox vaccine (vCP1452) developed by Aventis Pasteur. This vaccine contains sequences encoding HIV-1 Gag (LAI), envelope gp120 (MN) linked to the transmembrane portion of gp41 (LAI), protease (LAI), and a synthetic polynucleotide encompassing several known human CTL epitopes from Pol (LAI) and Nef (BRU). Subject M00724 received three priming immunizations with a DNA HIV-1 Gag in alum formulation followed by a boost with recombinant adenoviral vaccine encoding HIV-1 Gag (Ad5) developed by Merck Research Laboratory. Twenty-one HIV-1-seropositive individuals were evaluated in this study: 4 in early infection (defined as within the first 700 days of infection), 10 LTNP (defined as HIV-infected ≥10 years, viral load <10,000 copies/ml, and sustained CD4 counts in the absence of antiretroviral therapy (ART)), and 7 chronically infected (defined as HIV-infected >5 years, viral load >10,000 copies/ml or declining CD4 counts in the absence of ART). In addition, 4 HIV-seronegative volunteers who had received potential HIV-1-vaccine candidates were evaluated. The subjects were recruited and enrolled at the HIV Vaccine Trials Units (vaccine responders/LTNP) and the University of Washington Primary Infection Clinic. The appropriate Institutional Review Boards approved the studies, and volunteers provided written consent. HIV-1 15-mer peptides, overlapping by 11 aa and spanning the entire HIV-1 proteome, were used to identify which epitope specificities were recognized by each infected individual. The sequences of Gag, Pol, and Tat were based on HIV-1HXB2; the Env peptides were based on HIV-1MN and Nef peptides were based on HIV-1BRU (〈http://hiv-web.lanl.gov〉). Additionally, 8- to 11-mer corresponding to the described class I HLA-restricted CTL epitopes were also tested according to an individual’s HLA type. In cases where PBMC were limiting, PBMC were only tested against known CTL epitopes that corresponded to the individual’s HLA type. Anaspec synthesized the Gag, Nef, Env, and Pol peptides, and the Shared Resources Center at the Fred Hutchinson Cancer Research Center synthesized the Tat peptides. The National Institutes of Health AIDS Research and Reference Reagent Program provided all other peptides. Cryopreserved PBMC were thawed and rested overnight at 37°C before use at 200,000 PBMC/well in IFN-γ ELISPOT assays (BD Biosciences) following the manufacturer’s guidelines. Peptides were used at a final concentration of 1 μg/ml. PHA-P (1 μg/ml; Murex) served as a positive control, and medium alone wells served as a negative control. Positive responses were designated when the number of spot-forming cells were twice background and at least 50 spot-forming cells/106 PBMC. For functional avidity measurements, standard IFN-γ ELISPOT was performed with the indicated peptides at dilutions ranging from 40 μg/ml to 6.4 × 10−4 μg/ml. The regression curves were drawn with the Sigmoidal Fit tool in the Origin 6.0 software. PBMC were washed in R10 and rested overnight. The next day, cells were washed and stimulated for 6 h in the presence of brefeldin A (10 μg/ml) with either staphylococcal enterotoxin B (1 μg/ml; Sigma-Aldrich) as a positive control, HIV-1 peptides (1 μg/ml each peptide/sample), or no peptide as a negative control. CD107a-PECy5 was added 15 min before stimulation. Intracellular staining was performed using standard techniques (BD Biosciences; cytokine flow cytometry protocol) using previously titrated Ab reagents. GolgiStop (BD) was used in addition to BFA in panels with anti-CD107a Ab. Anti-CD3-APCCy7, -CD8-PerCPCy5.5, -IFN-γ-PE-Cy7, -IL-2-PE, -TNF-α-allophycocyanin , and -CD107a-PECy5 mAbs were supplied by BD Biosciences and BD Pharmingen. Data acquisition was performed on an LSRII flow cytometer (BD Biosciences), collecting 100,000–200,000 lymphocyte gated, or 10,000–40,000 CD8+ events per sample, and analyzed with FlowJo software (Tree Star). Positive responses were designated when the percentage of bright cytokine+CD8+ T cells was twice that of the negative control. All data shown are background subtracted. PBMC were labeled with 1.25 μM CFSE (Molecular Probes) for 8 min in the dark at 37°C, and free CFSE was quenched with 100% 4°C FCS for 1 min. Labeled cells were washed before in vitro culture with 2 μg/ml HIV-1 peptides for 5 days. As a positive control, the cells were stimulated with 30 ng/ml anti-CD3/1 μg/ml anti-CD28 mAbs. Proliferation was measured as the percentage of CFSElowCD8+ T cells. RK9/A3-PE or -allophycocyanin-labeled tetramers were provided by the National Institutes of Health AIDS Research and Reference Reagent Program (Bethesda, MD) or the Fred Hutchinson Cancer Research Center Shared Resources facility. Tetramer concentration was optimized before experiments described in this study and were then used for surface staining of ex vivo PBMC or cultured CFSE-labeled cells. Total cellular RNA was purified from 5 to 10 × 106 cryopreserved PBMC using the RNeasy minikit (Qiagen). The HIV-1 sequences were amplified by standard RT-PCR using SuperScript II reverse transcriptase and Platinum Taq polymerase (Invitrogen Life Technologies). The cDNA was amplified by PCR over 35 cycles (30 s at 94°C, 30 s at 58°C, and 1 min at 72°C). The Gag epitopic region of interest, with the exception of Gag RLRPGGKKK, was amplified using the primer set Gag 5′ (TCAGTATTAAGCGGGGGAGA) and Gag 3′ (CCTTGTCTTATGTCCAGAATGC). The Gag epitope RLRPGGKKK was amplified using the primer set RK9 5′ (TAGCGGAGGCTAGAAGGAGA) and RK9 3′ (AACAGGCCAGGATTAACTGC). The PCR products were cloned into the TA cloning vector for sequencing according to the manufacturer’s protocol (Invitrogen Life Technologies). Plasmids from individual clones were isolated using QIAprep Spin Miniprep Kit (Qiagen) and sequenced using T7 forward and reverse primers with ABI Prism Big Dye Terminator Cycle sequence reagents (Applied Biosystems). Computational analysis of obtained sequences was performed using database and software package fromExPASy Proteomics Server (〈http://us.expasy.org/〉) and Los Alamos HIV database (〈http://hiv-web.lanl.gov/content/index〉). All statistical analyses were performed using either Jmp version 5.0 or SAS version 8.2 software (SAS Institute). Correlations between tetramer, cytokine secretion, degranulation, avidity, and proliferative capacity were performed by nonparametric Spearman ρ analysis. The statistical significance for the comparison between groups was performed using the nonparametric one-sided Wilcoxon-signed rank test. Because HIV-specific T cells can secrete IFN-γ regardless of proliferative or cytolytic activities (9, 15), we used the IFN-γ ELISPOT assay to first identify and define epitope specificities of CD8+ T cell responses in vaccinated and infected subjects, whose demographic and clinical profiles are outlined in Table I⇓⇓. CD8+ T cells from four HLA-A3+ HIV-1-uninfected vaccine recipients recognized the same single A3-restricted HIV-1 epitope, RLRPGGKKK (RK9) (data not shown). This Gag epitope, commonly recognized by CD8+ T cells from HLA-A3+ HIV-1-infected individuals (16) was also seen by CD8+ T cells from 11 patients in our study: 4 with LTNP, 3 with chronic progressive disease, and 4 with early infection (Table I⇓⇓ and data not shown). Using MHC/peptide tetramer staining and CFSE labeling, we compared A3-restricted, RK9-specific T cell responses in the 4 vaccinees to those in the 11 HIV-1-infected individuals; Fig. 1⇓a summarizes the findings, and Fig. 1⇓b depicts representative examples. Vaccine-induced, ex vivo RK9-specific T cells from HIV-1-uninfected subjects were able to bind tetramers (Fig. 1⇓a, top panel; percentages of tetramer-positive cells ranged from 0.05 to 1.3%) and secrete IFN-γ (Fig. 1⇓a, middle panel, and Fig. 1⇓b) when they encountered RK9 (Fig. 1⇓a). Similarly, RK9-specific T cells from HIV-infected individuals, regardless of viral load, were able to bind tetramers ex vivo as well as secrete both IFN-γ (Fig. 1⇓a) and TNF-α (data not shown). Proliferative HIV-1-specific T cell responses measured by flow cytometry. a, RK9-specific CD8+ T cell responses in HIV-1-uninfected immunocompetent vaccine recipients and HIV-1-infected individuals. Top panel, Percentage of ex vivo RK9 tetramer+CD8+ T cells. Middle panel, Percentage of ex vivo RK9-specific IFN-γ+CD8+ T cells. Bottom panel, Percentage of CFSElowIFN-γ+CD8+ T cells after culture with RK9 peptide for 5 days, and restimulation with RK9 peptide for 6 h. ∗, Denotes that no clinical information was available at sample date. The mean of available clinical information is presented. Data from NP14 were collected from 13.9 years postinfection when this individual was classed as a LTNP. b, Vaccinee T cell responses (left two columns) vs T cell responses from an HIV-infected individual (last two columns) after 5 days in vitro culture in either medium (No Stimulation) or RK9 peptide. All cultured cells were restimulated with either no peptide (top panels) or RK9 peptide (bottom panels) for 6 h for measurement of INF-γ. All cultured cells were restimulated with either no peptide (top panels) or RK9 peptide (bottom panels) for 6 h for measurement of IFN-γ. c, CFSE labeling and tetramer staining from a vaccinee (top panels) and a HIV-1-infected individual (bottom panels). PBMC were cultured in medium alone (left column) or RK9 peptide (right column). All data shown are gated on CD3+/CD8+ lymphocytes. We further defined the range of functionality among the memory RK9-specific CD8+ T cells. Among 15 RK9-specific T cell responders analyzed (Fig. 1⇑), the percentage of tetramer-positive cells correlated with the percentage of CD8+ T cells secreting IFN-γ (Spearman’s correlation coefficient (ρ): 0.78; p < 0.001). The percentage of IFN-γ-secreting RK9-specific T cells that also secreted TNF-α varied from 21 to 100% (median = 84%). Moreover, between 29 and 100% of these cells (median 76%) were able to degranulate, as measured by CD107a expression (17) in response to RK9 (data not shown). There was no significant linear correlation found between proliferation capacity of CD8+ T cells and their ability to secrete IFN-γ (ρ: −0.08; p = 0.79) and/or degranulate (ρ: −0.15; p = 0.60) (see below). We next stimulated PBMC with the RK9 peptide for 5 days and examined by flow cytometry the ability of CD8+ T cells to proliferate by loss of CFSE staining and to maintain IFN-γ secretion by intracellular expression. The RK9-specific CD8+ T cells from the 4 vaccinees were capable of expansion and IFN-γ secretion (Fig. 1⇑a, lower left panel, and b, lower middle panel). By contrast, CD8+ T cells from most infected subjects (7 of 11, infected for a median of 5,357 days), including LTNP, failed to proliferate, as evidenced by the near absence of CFSElow IFN-γ-secreting T cells (Fig. 1a, bottom panel, and b, lower right panel). However, it is noteworthy that 4 of the 11 infected individuals (CHPIC 1238, 1396, 1596, and SAC12) possessed RK9-specific T cells that were able to proliferate (last column, Fig. 1⇑a). These were subjects recruited during primary infection, and their T cells were assayed within 2 years of HIV infection (median 317 days) (Table I⇑⇑). 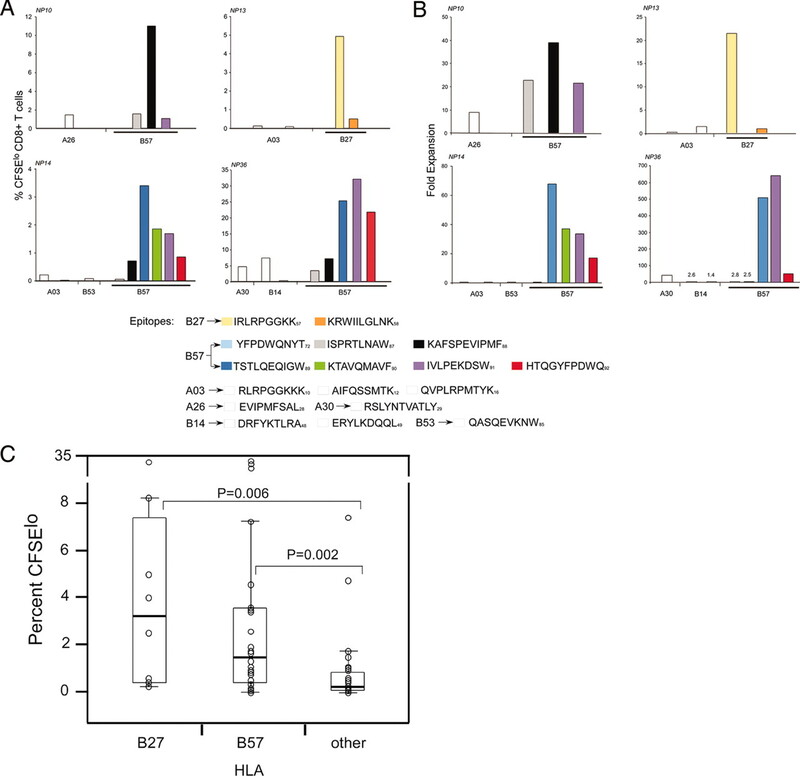 These results indicate that vaccines can induce CD8+ T cells recognizing epitopes commonly seen during natural infection, and they can proliferate when exposed to their cognate Ag, unlike those found during chronic infection. Moreover, the acquisition of the CD8+ T cell proliferative defect occurs later in infection rather than early. We observed that T cell expansions in HIV-infected individuals were not significantly correlated with the initial frequency of RK9-specific T cells, as measured by tetramer staining on day 0 (ρ: −0.37; p = 0.18; Fig. 1⇑a). To understand the fate of the CD8+ T cells following in vitro RK9 stimulation, we examined those from a vaccinee and a LTNP in comparison to those from parallel cultures in medium alone. As shown in Fig. 1⇑c, following RK9 stimulation, almost all proliferating cells from the vaccinee were tetramer-positive cells. By contrast, LTNP tetramer-positive cells were present in the medium alone culture, but proliferating tetramer-positive cells were not detected in the culture stimulated with RK9 (Fig. 1⇑c). In this study, we demonstrate that RK9-specific CD8+ T cells from LTNP, similar to chronic progressors, lacked proliferative capacity (Fig. 1⇑a, bottom panel). However, Migueles et al. (9) showed that T cells from LTNP can proliferate, whereas those from progressors cannot. We sought to reconcile these different findings. Of note, Migueles et al. (9) focused primarily on bulk HIV-1-specific CD8+ T cell responses (i.e., the total T cell response against HIV-infected CD4+ T cells), whereas we focused on CD8+ responses at the epitopic level. Although some epitope-specific data were shown by Migueles et al. (9) using tetramer technology, they did not examine the differences between proliferative ability of T cells restricted by “protective” vs “nonprotective” HLA alleles within each individual. We hypothesized that T cells specific for different epitopes function differently to chronic stimulation, and that LTNP possess T cells that recognize additional epitopes that can proliferate upon stimulation. To address this issue, CD8+ T cells from several HIV-infected individuals were tested again for recognition of both the RK9 epitope as well as other HIV-1 epitopes (summarized in Table II⇓). As shown in Fig. 2⇓a, within the same subject there were 38 times more CFSElowCD8+ T cells restricted by MHC alleles associated with nonprogression (HLA-B27 and -B57) than restricted by HLA-A3 (NP13 and NP14), suggesting that T cells restricted by HLA-B27/-B57 have a greater proliferative capacity than T cells restricted by non-B27/-B57 alleles. To show that proliferative responses were not biased by the initial frequency of epitope-specific T cells, the data are also shown as fold expansions (calculated by dividing the percentage of CFSElowCD8+ T cells by the ex vivo percentage of IFN-γ+CD8+ T cells. To ensure that fold expansions were not over inflated by very low frequency responses, ex vivo IFN-γ+ responses below 0.05% CD8+ T cells were set at 0.05% (Fig. 2⇓b). We extended this analysis to an additional 10 subjects who possessed HLA-B27 or -B57 but not HLA-A3 (summarized in Table II⇓). These findings confirm that HLA-B27 or B57-restricted T cells have greater proliferative ability than HIV-specific T cells restricted by alleles that have not been associated with nonprogression (representative examples shown in Fig. 2⇓a; all data shown in Fig. 2⇓c; p = 0.006 for B27 vs other alleles, and p = 0.002 for B57 vs other alleles). Within each individual, the median percentage of CFSElow of the B27/B57-restricted responses were significantly greater than the maximum percentage of CFSElow of the non-B27/B57-restricted responses (p = 0.03). We compared the median B27/57-restricted responses to the maximum of the non-B27/57-restricted responses because within individual comparisons in HLA-B57+, individuals are confounded by the fact that the majority of HIV-specific responses are restricted by HLA-B57, as has been reported previously (18), and, thus, very few HIV-1-specific responses are non-B57-restricted. However, this finding serves as a strong indication that the maximum proliferation occurs from the B27/B57-restricted responses. Similar to the RK9-specific responses, IFN-γ secretion correlated with TNF-α secretion (ρ = 0.84; p < 0.0001), IL-2 secretion (ρ = 0.65; p < 0.0001), and degranulation as measured by CD107a expression (ρ = 0.87; p < 0.0001). There was no correlation between secretion of any of the cytokines/degranulation and proliferative ability of the epitope-specific T cells (ρ = 0.09, p = 0.48 for IFN-γ; ρ = 0.15, p = 0.22 for TNF-α; ρ = 0.07, p = 0.58 for IL-2; and ρ = 0.19, p = 0.13 for CD107a). Proliferative capacity of HIV-specific T cell responses measured by percentage of CFSElowCD8+ T cells after in vitro culture with peptide. a, Responses in four different individuals. Each bar refers to a different epitope specificity restricted by a distinct class I MHC allele. Sequences of the defined epitopes are listed below the figure. b, Same data as a but viewed as fold expansion, which was calculated by dividing the percentage of CFSElowCD8+ T cells by the ex vivo percentage of IFN-γ+CD8+ T cells. To ensure that fold expansions were not over inflated by very low frequency responses, ex vivo IFN-γ+ responses below 0.05% CD8+ T cells were set at 0.05%. c, Comparison of percentage of CFSElow of HLA-B27 and -B57-restricted T cell responses to those restricted by other alleles (including HLA-A02, -A03, -A24, -A26, -A30, -A68, -B07, -B14, -B15, -B35, -B40 and B53). In HLA-B57+ LTNP individuals, CD8+ T cells recognized a median of four (mean, 4.4) HIV-1 B57-restricted epitopes. Within each individual, there was always at least one B57-restricted response that proliferated strongly. However, not every B57-restricted T cell proliferated equally well (representative examples in Fig. 2⇑, a and/or b, and Table II⇑). There was no specific pattern indicating which particular B57-restricted epitope would proliferate best in each individual. Moreover, proliferative dominance for a given B57-restricted epitope varied among individuals (Table II⇑). These data suggest that eventual induction of replication-defective responses may, in part, explain why some B57+ individuals eventually progress to disease. Indeed, our data, when stratified by disease status (B57+ LTNP vs B57+ chronic progressors), show that B57-restricted T cells in LTNP expand more than those from individuals who are not controlling infection (p = 0.05; Table II⇑). To determine whether differences in proliferative ability could be due to differences in true cognate epitope recognition in vivo compared with that being presented in vitro, we sequenced autologous virus in seven individuals (Table III⇓). The data show that differences in proliferative ability cannot be explained by differences in true cognate epitope in vivo compared with that being presented in vitro, because there are examples of T cells that did not proliferate when the autologous peptide sequence was identical with the sequence used for in vitro stimulation (SAC13 RK9 A3-restricted and SL9 A2-restricted responses, NP33 IL-10 B40-restricted response, NP20 SL9 A2-restricted response, and NP13 RK9 A3-restricted response). Furthermore, there were instances where T cells proliferated even though the majority of their autologous viral sequences possessed mutations (SAC12 RK9 A3-restricted response, NP36 RY11 A30-restricted response, and NP33 IW9 B57-restricted response). Our observation of the loss of proliferative ability but maintenance of cytokine secretion is reminiscent of activation-induced nonresponsiveness (AINR), which has been described in murine models of tumor immunity (19, 20, 21) and tolerance induction (22). Because AINR can be thought of as a mechanism of peripheral tolerance, it is logical to assume that mechanisms that contribute to tolerance induction will contribute to the induction of (or resistance to) AINR. High-avidity TCRs are less prone to tolerance induction than low-avidity TCRs (23). Therefore, we measured functional avidity of T cells that proliferate vs those that cannot proliferate to determine whether maintenance of proliferative ability (resistance to AINR) is due to TCR avidity. The EC50s are shown in Table II⇑. Using this method of functional avidity measurement (IFN-γ secretion at decreasing cognate peptide concentrations), there is a correlation between avidity and proliferative ability (ρ = 0.50, p < 0.0001 for all individuals; ρ = 0.63, p = 0.0001 for LTNP vs 0.37; p = 0.05 for chronically infected individuals). Surprisingly, this result suggests that lower avidity T cells may be able to proliferate better than higher avidity T cells because the correlation is positive. Our findings provide an explanation for the observed association between HLA-B27/-B57 and control of HIV-1 infection. We show that HIV-1-specific T cells restricted by these alleles are able to maintain proliferative capacity after prolonged chronic infection. These data build on the study reported by Migueles et al. (9) who showed that HIV-1-specific CD8+ T cells from LTNP can proliferate, whereas those from chronically infected individuals cannot. This previous report on proliferative potential of HIV-1-specific CD8+ T cells focused on bulk T cell rather than epitope-specific responses. However, we have shown that, even within individuals who are controlling infection, not all HIV-1-specific T cells maintain proliferative capacity, and that this is dependent on their specificity and HLA restriction. It is interesting to speculate that induction of tolerance in HIV-specific T cells may contribute to, and be predictive of, HIV-1 disease progression. Interestingly, NP8 was the only LTNP whose B57-restricted T cells had poor proliferative ability (Table II⇑). This individual was classified as a LTNP when these assays were performed. However, within 1 year of this time point, his CD4 counts declined and he has subsequently started ART. Our data suggest that, during chronic infection, HIV-1-specific T cells possess different proliferative capacities regardless of their ability to secrete IFN-γ, TNF-α, IL-2, or their ability to degranulate (as measured by CD107a expression). Surprisingly, we found no correlation between proliferative ability and IL-2 production in epitope-specific CD8+ T cell responses in contrast to data produced by Zimmerli et al. (24). However, the correlations by Zimmerli et al. (24) were performed on proliferation/IL-2 secretion of bulk HIV-specific responses, not at the epitope-specific level. Another recent report measuring IFN-γ, MIP-1β, CD107a, TNF-α, and IL-2 has suggested that CD8+ T cells from LTNP have a higher degree of functionality in that they retain these five functions, whereas progressors do not (25). Our data suggest that measurement of IFN-γ, TNF-α, IL-2, and CD107a does not discriminate at the epitope-specific level between CD8+ T cells that can proliferate and those that cannot. Because we have shown that, within the same individual, CD8+ T cells with different epitopic specificities have differential proliferative ability, it is not possible to show these differences by measurement of bulk HIV-specific CD8+ T cell responses. This may explain why Betts et al. (25) were not able to show functional differences between CD8+ T cells when stratified by HLA-B57 status. Because proliferative capacity is associated with perforin content (9) and viral control in murine models (26, 27), replication-competent T cells (B27/57-restricted) may have greater ability to control HIV-1. This may explain why these alleles are associated with protection from disease progression. Furthermore, induction of replication defects may be considered as a form of peripheral tolerance. Thus, our findings may also explain why B27 and B57 are often associated with autoimmune disease (28, 29, 30). In this case, if T cells restricted by these alleles are resistant to replicative defects, they may also be more resistant to peripheral tolerance. Induction of replicative defects may also be involved in lack of control of other chronic viral infections, and we would predict that HLA-B27 and -B57 would be advantageous in these settings. Indeed, HLA-B27 has recently been associated with clearance of hepatitis C infection (31). The replication-defective responses described in this study are reminiscent of the effector memory (TEM) population described in the murine lymphocytic choriomeningitis virus model. This model suggests that virus-specific CD8+ T cells progress through a linear maturation process from naive (TN)→ effector (TE)→ TEM→ central memory (TCM) (26, 27). These studies also showed that virus-specific CD8+ TE and TEM cells are less efficient at controlling re-exposure to virus than TCM cells. The major difference in these populations was the ability of TCM to proliferate in response to re-encountering cognate Ag, whereas both TE and TEM cells lacked proliferative potential (26, 27). It is possible that the TEM population described in murine models and the replication-defective populations described in this study are, in fact, one and the same. From the murine model, it would be predicted that HIV-1-specific B27/B57-restricted T cells (which are resistant to replicative defects) would be more effective at controlling viral infection than HIV-1-specific T cells that are susceptible to replicative defects. The inverse correlation between T cell avidity (as determined by EC50 measurement) and ability to proliferate suggests that lower avidity T cells may be able to resist proliferative defects. Thus, we hypothesize that the low abundance of HIV-1 Ag present in LTNP will lead to constant stimulation of high-avidity T cells, eventually causing them to undergo replicative failure. Low-avidity T cells will not be stimulated under these conditions of low Ag load and will, therefore, be spared from replicative defects. When HIV-1 Ag load increases (for example, when escape from T cell responses occurs), both high- and low-avidity T cells will be constantly stimulated and undergo replicative defects. This process may explain why some B57+ individuals eventually progress. Finally, our study provides evidence that memory CD8+ T cells, restricted by nonprotective alleles such as HLA-A3, induced by vaccination in seronegative immunocompetent individuals are functionally similar to T cells restricted by alleles associated with protection. Maintenance of proliferative capacity in this instance is likely due to the lack of prolonged chronic stimulation seen in the context of vaccination. If vaccines induce immune responses that can effectively control viral load to very low levels, HIV-specific T cells, regardless of MHC restriction, may be spared from tolerance (or at least delay onset of tolerance). We would predict that maintenance of proliferative ability would result in a disease course that is similar to LTNP. Larger scale vaccine trials are underway to evaluate immunogens designed to elicit class I-restricted CD8+ T. Thus, it will be important to understand whether vaccine-induced HIV-1-specific T cell immunity, although not sufficient to protect against infection, can function more efficiently by resisting replicative defects. We predict that HIV-1-specific T cells that maintain proliferative capacity following infection may prove to be an important correlate of disease protection and vaccine efficacy. We thank Xia Jin for insightful discussion. Special appreciation goes to the study volunteers for their commitment and the dedicated clinical staff at the University of Washington/Fred Hutchinson Cancer Research Center primary infection clinic and the Seattle HIV Vaccine Trials Unit. In addition, we acknowledge the collaboration of the HIV Vaccine Trials Network investigators and the vaccine sponsors Aventis Pasteur and Merck Research Laboratories. ↵1 This work was supported by Grants U01 AI 4674, U01 AI 46725, P01 AI 057005, R01 AI65328-01, and M01-RR-00037 from the National Institutes of Health. ↵3 Abbreviations used in this paper: LTNP, long-term nonprogressor; ART, antiretroviral therapy; AINR, activation-induced nonresponsiveness; TEM, effector memory; TE, effector; TCM, central memory. Kaslow, R. A., M. Carrington, R. Apple, L. Park, A. Munoz, A. J. Saah, J. J. Goedert, C. Winkler, S. J. O’Brien, C. Rinaldo, et al 1996. Influence of combinations of human major histocompatibility complex genes on the course of HIV-1 infection. Nat. Med. 2: 405-411. Carrington, M., S. O’Brien. 2003. The Influence of HLA genotype on AIDS. Annu. Rev. Med. 54: 535-551. Hendel, H., S. Caillat-Zucman, H. Lebuanec, M. Carrington, S. J. O’Brien, J.-M. Andrieu, F. Schachter, D. Zagury, J. Rappaport, C. Winkler, et al 1999. New class I and II HLA alleles strongly associated with opposite patterns of progression to AIDS. J. Immunol. 162: 6942-6946. Borrow, P., H. Lewicki, X. Wei, M. S. Horwitz, N. Peffer, H. Meyers, J. A. Nelson, J. E. Gairin, B. H. Hahn, M. B. Oldstone, G. M. Shaw. 1997. Antiviral pressure exerted by HIV-1-specific cytotoxic T lymphocytes (CTLs) during primary infection demonstrated by rapid selection of CTL escape virus. Nat. Med. 3: 205-211. Goulder, P. J., R. E. Phillips, R. A. Colbert, S. McAdam, G. Ogg, M. A. Nowak, P. Giangrande, G. Luzzi, B. Morgan, A. Edwards, et al 1997. Late escape from an immunodominant cytotoxic T-lymphocyte response associated with progression to AIDS. Nat. Med. 3: 212-217. Price, D. A., P. J. Goulder, P. Klenerman, A. K. Sewell, P. J. Easterbrook, M. Troop, C. R. Bangham, R. E. Phillips. 1997. Positive selection of HIV-1 cytotoxic T lymphocyte escape variants during primary infection. Proc. Natl. Acad. Sci. USA 94: 1890-1895. Cao, J., J. McNevin, U. Malhotra, M. J. McElrath. 2003. Evolution of CD8+ T cell immunity and viral escape following acute HIV-1 infection. J. Immunol. 171: 3837-3846. Migueles, S. A., A. C. Laborico, W. L. Shupert, M. S. Sabbaghian, R. Rabin, C. W. Hallahan, D. Van Baarle, S. Kostense, F. Miedema, M. McLaughlin, et al 2002. HIV-specific CD8+ T cell proliferation is coupled to perforin expression and is maintained in nonprogressors. Nat. Immunol. 3: 1061-1068. Harrer, T., E. Harrer, S. A. Kalams, P. Barbosa, A. Trocha, R. P. Johnson, T. Elbeik, M. B. Feinberg, S. P. Buchbinder, B. D. Walker. 1996. Cytotoxic T lymphocytes in asymptomatic long-term nonprogressing HIV-1 infection: breadth and specificity of the response and relation to in vivo viral quasispecies in a person with prolonged infection and low viral load. J. Immunol. 156: 2616-2623. Harrer, T., E. Harrer, S. A. Kalams, T. Elbeik, S. I. Staprans, M. B. Feinberg, Y. Cao, D. D. Ho, T. Yilma, A. M. Caliendo, et al 1996. Strong cytotoxic T cell and weak neutralizing antibody responses in a subset of persons with stable nonprogressing HIV type 1 infection. AIDS Res. Hum. Retroviruses 12: 585-592. Musey, L. K., J. N. Krieger, J. P. Hughes, T. W. Schacker, L. Corey, M. J. McElrath. 1999. Early and persistent human immunodeficiency virus type 1 (HIV-1)-specific T helper dysfunction in blood and lymph nodes following acute HIV-1 infection. J. Infect. Dis. 180: 278-284. Malhotra, U., M. M. Berrey, Y. Huang, J. Markee, D. J. Brown, S. Ap, L. Musey, T. Schacker, L. Corey, M. J. McElrath. 2000. Effect of combination antiretroviral therapy on T-cell immunity in acute human immunodeficiency virus type 1 infection. J. Infect. Dis. 181: 121-131. Lichterfeld, M., D. E. Kaufmann, X. G. Yu, S. K. Mui, M. M. Addo, M. N. Johnston, D. Cohen, G. K. Robbins, E. Pae, G. Alter, et al 2004. Loss of HIV-1-specific CD8+ T cell proliferation after acute HIV-1 infection and restoration by vaccine-induced HIV-1-specific CD4+ T cells. J. Exp. Med. 200: 701-712. Appay, V., D. F. Nixon, S. M. Donahoe, G. M. Gillespie, T. Dong, A. King, G. S. Ogg, H. M. Spiegel, C. Conlon, C. A. Spina, et al 2000. HIV-specific CD8+ T cells produce antiviral cytokines but are impaired in cytolytic function. J. Exp. Med. 192: 63-75. Cao, J., J. McNevin, S. Holte, L. Fink, L. Corey, M. J. McElrath. 2003. 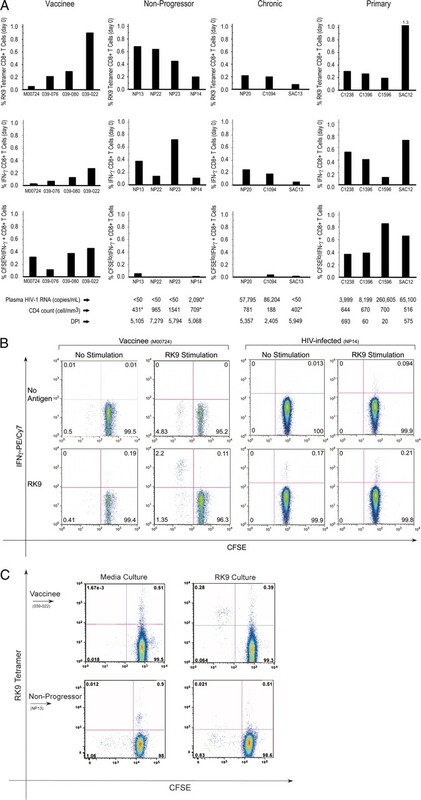 Comprehensive analysis of human immunodeficiency virus type 1 (HIV-1)-specific γ interferon-secreting CD8+ T cells in primary HIV-1 infection. J. Virol. 77: 6867-6878. Betts, M. R., J. M. Brenchley, D. A. Price, S. C. De Rosa, D. C. Douek, M. Roederer, R. Koup. 2003. Sensitive and viable identification of antigen-specific CD8+ T cells by a flow cytometric assay for degranulation. J. Immunol. Methods 281: 65-78. Altfeld, M., M. M. Addo, E. S. Rosenberg, F. M. Hecht, P. K. Lee, M. Vogel, X. G. Yu, R. Draenert, M. N. Johnston, D. Strick, et al 2003. Influence of HLA-B57 on clinical presentation and viral control during acute HIV-1 infection. AIDS 17: 2581-2591. Shrikant, P., M. F. Mescher. 1999. Control of syngeneic tumor growth by activation of CD8+ T cells: efficacy is limited by migration away from the site and induction of nonresponsiveness. J. Immunol. 162: 2858-2866. Tham, E. L., M. F. Mescher. 2001. Signaling alterations in activation-induced nonresponsive CD8 T cells. J. Immunol. 167: 2040-2048. Tham, E. L., P. Shrikant, M. F. Mescher. 2002. Activation-induced nonresponsiveness: a Th-dependent regulatory checkpoint in the CTL response. J. Immunol. 168: 1190-1197. Ehl, S., W. Barchet, S. Oehen, P. Aichele, J. Hombach, H. Hengartner, R. M. Zinkernagel. 2000. Donor cell persistence and activation-induced unresponsiveness of peripheral CD8+ T cells. Eur. J. Immunol. 30: 883-891. Perchellet, A., I. Stromnes, J. M. Pang, J. Goverman. 2004. CD8+ T cells maintain tolerance to myelin basic protein by “epitope theft”. Nat. Immunol. 5: 606-614. Zimmerli, S. C., A. Harari, C. Cellerai, F. Vallelian, P.-A. Bart, G. Pantaleo. 2005. HIV-1-specific IFN-γ/IL-2-secreting CD8 T cells support CD4-independent proliferation of HIV-1-specific CD8 T cells. Proc. Natl. Acad. Sci. USA 102: 7239-7244. Betts, M. R., M. C. Nason, S. M. West, S. C. De Rosa, S. A. Migueles, J. Abraham, M. M. Lederman, J. M. Benito, P. A. Goepfert, M. Connors, et al 2006. HIV nonprogressors preferentially maintain highly functional HIV-specific CD8+ T cells. Blood 107: 4791-4789. Fiorillo, M. T., M. Maragno, R. Butler, M. L. Dupuis, R. Sorrentino. 2000. CD8+ T-cell autoreactivity to an HLA-B27-restricted self-epitope correlates with ankylosing spondylitis. J. Clin. Invest. 106: 47-53. Vasilca, V., A. Vasilca, D. Munteanu, D. Constantinescu, C. Livideanu, M. Tepelus, F. Zugun, E. Carasevici. 2002. HLA-B57 is significantly associated with psoriasis in Northeast Romania. Roum. Arch. Microbiol. Immunol. 61: 259-265. Vejbaesya, S., T. H. Eiermann, P. Suthipinititharm, C. Bancha, H. A. Stephens, K. Luangtrakool, D. Chandanayingyong. 1998. Serological and molecular analysis of HLA class I and II alleles in Thai patients with psoriasis vulgaris. Tissue Antigens 52: 389-392. McKiernan, S. M., R. Hagan, M. Curry, G. S. A. McDonald, A. Kelly, N. Nolan, A. Walsh, J. Hegarty, E. Lawlor, D. Kelleher. 2004. Distinct MHC class I and II alleles are associated with hepatitis C viral clearance, originating from a single source. Hepatology 40: 108-114.